I’ve been in North Carolina for four years and I have yet to attend a pig pickin’. Luckily I was able to remedy that this past weekend! A pig pickin’ is basically a a giant cook-out whose center-piece is a barbequed whole hog. My uncles have some friends in Raleigh who host an annual pig pickin’ at the end of every summer. They invite tons of friends and the whole neighborhood and close down the cul-de-sac where their house is located. The street is filled with tables and tents. 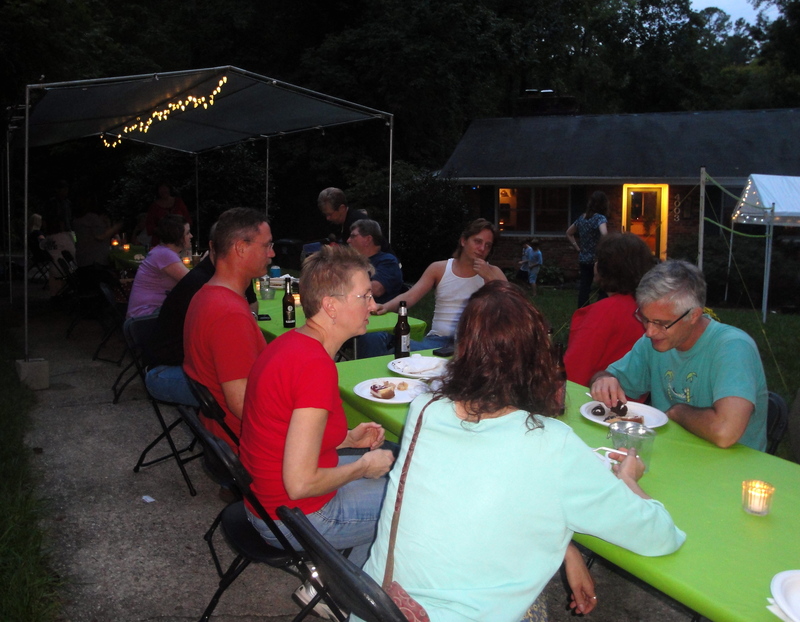 The hosts provide the meat and the dinnerware and all the guests bring a side or a dessert. Since so many people show up the amount of food is insane. 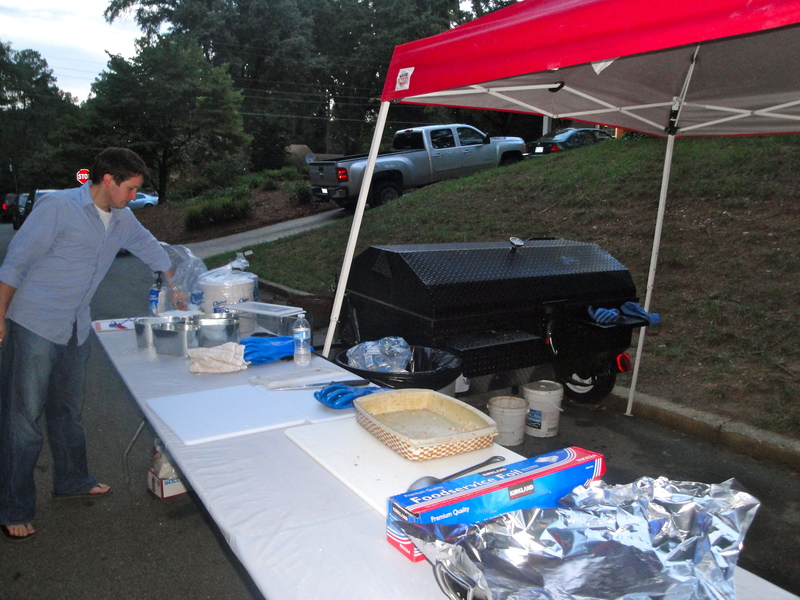 We arrived about two hours after the event officially started and there was still plenty of food left. I brought an apple cobbler to share. I’m hoping that people liked it! The hosts evidently used to prepare and cook the pig themselves but this year they hired some assistance. They also rented a huge barbeque on which to cook the pig. 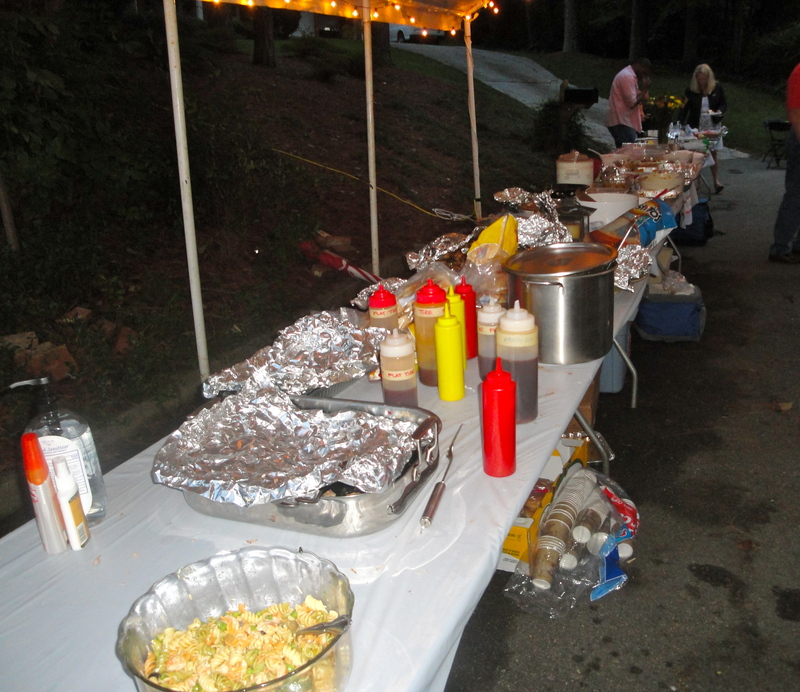 I didn’t have much pork since I’m not a huge pork-eater–I had a token bite or two–but I did indulge in some excellent chicken, a hot dog, a bunch of beans, and some random delicious cheesy casseroles. Oh and quite a bit of dessert: a peach cobbler, my apple cobbler, cheesecake, chocolate chip cookies, etc. I doubt that anyone went home hungry. This was really an end of summer bash. 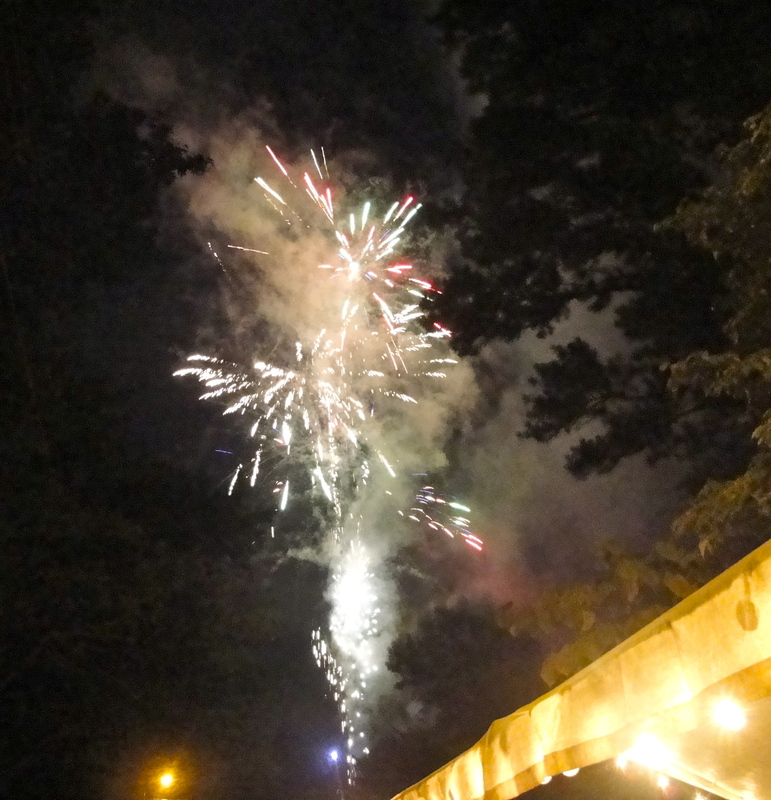 They even had fireworks! So cute! He belongs to the hosts. So fluffy. 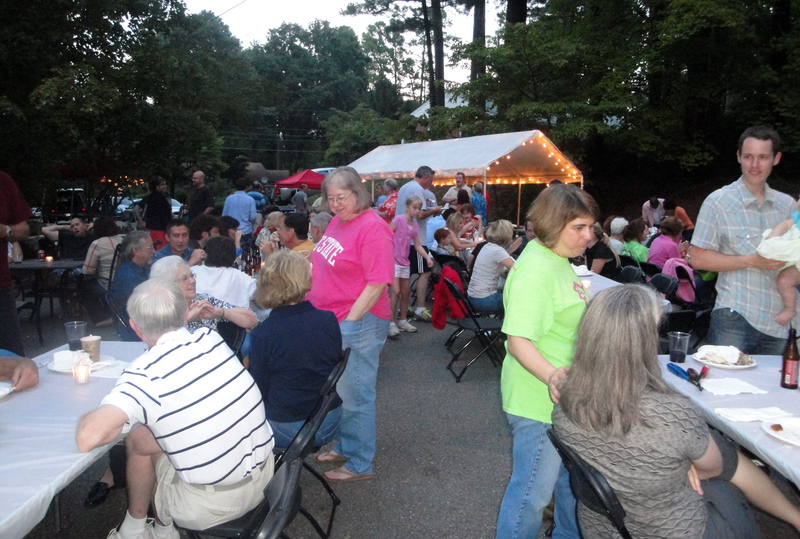 I’ve attended my last major cook-out of the season, I guess that means summer is officially over. 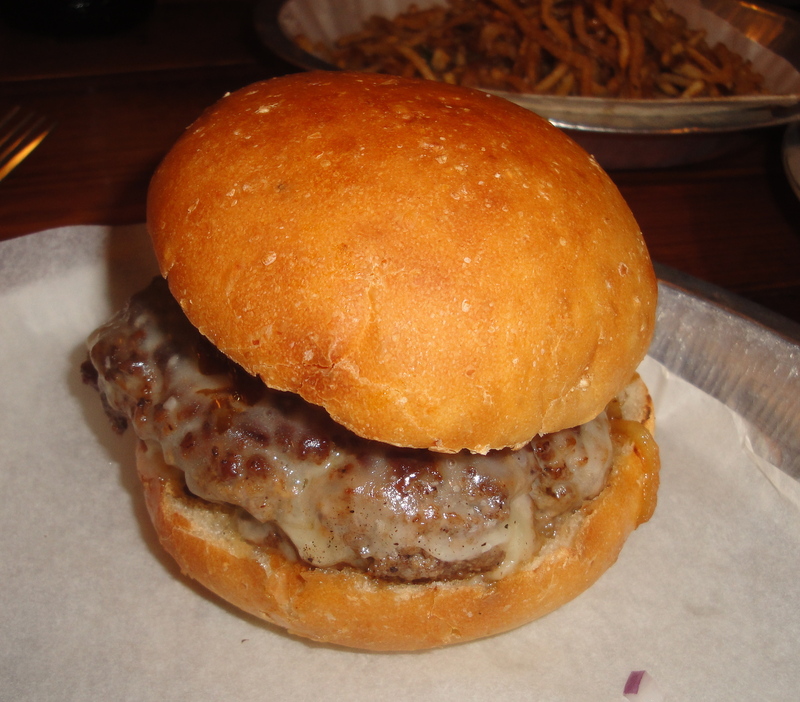 On Friday Jon and I finally got to Bull City Burger and Brewery. 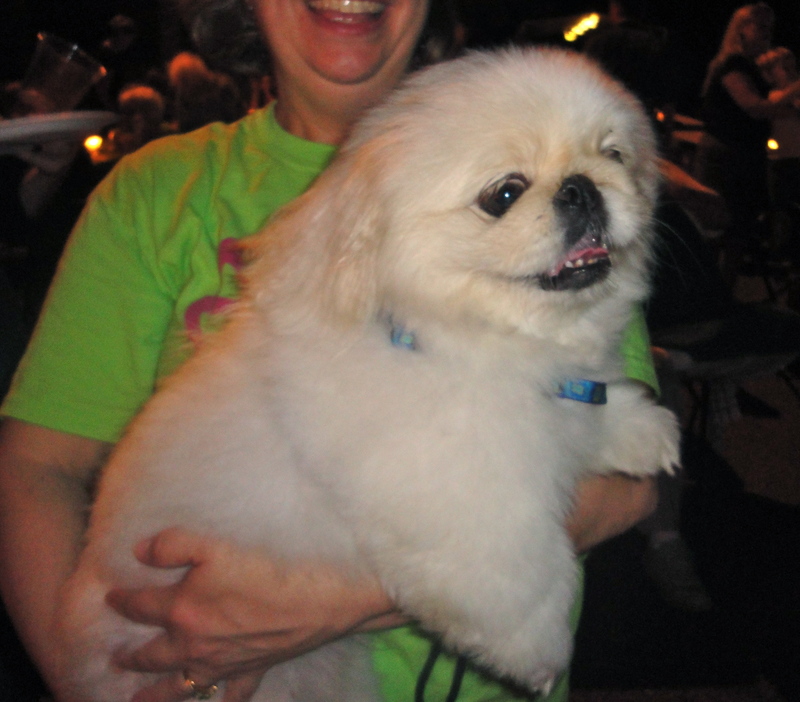 We went with Tammi and Scott. This is a burgers, hot dogs, and fries place in downtown Durham. All the ingredients are local and all the food is made in house. You know, all that locavore stuff. We arrived at 6:30, right before the 7:00 rush. The place quickly became packed. The set up his very beerhall: long tables that you share, and you really have to vulture to find a spot. But, you know, worth it. They do beer, but I don’t drink beer. Jon tried their seasonal harvest flavor and said it was quite good. I’ll take his word for it. 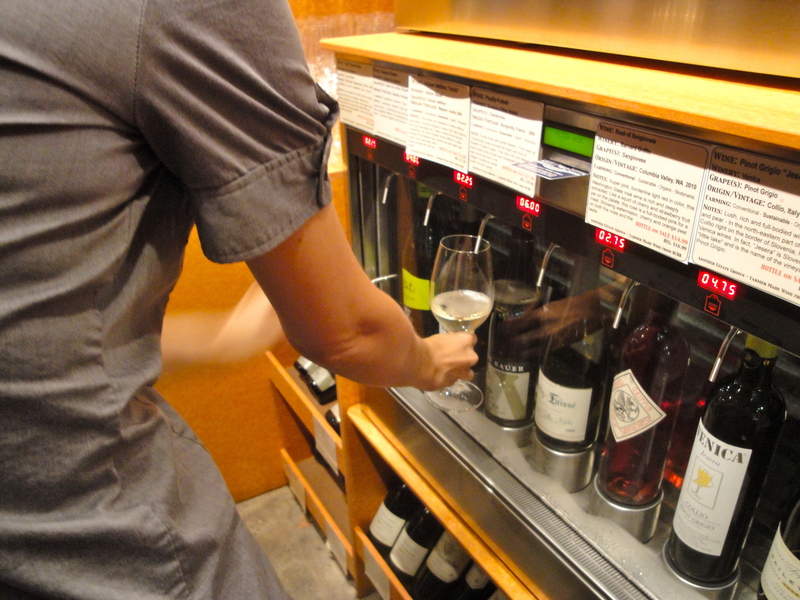 One of their more interesting features in an enomatic: and automated wine dispenser machine. Tammi decided to give it a try. You buy a card, place some money on it, and take said card to the enomatic. 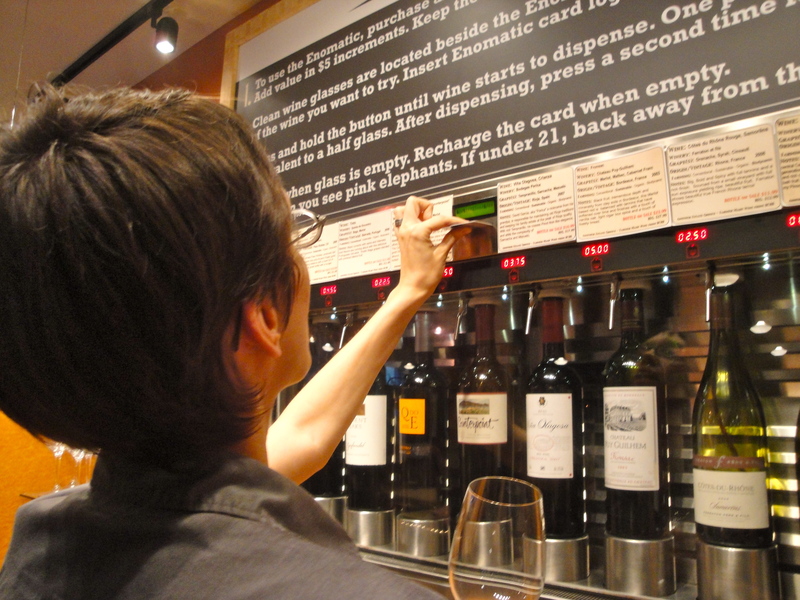 You insert the card, pick your wine and voila: wine for you. I was more into the Boylan soda fountain. Their diet cola is really good! I filled many a mason jar. We all got burgers. I got one with carmelized onions and gruyere. 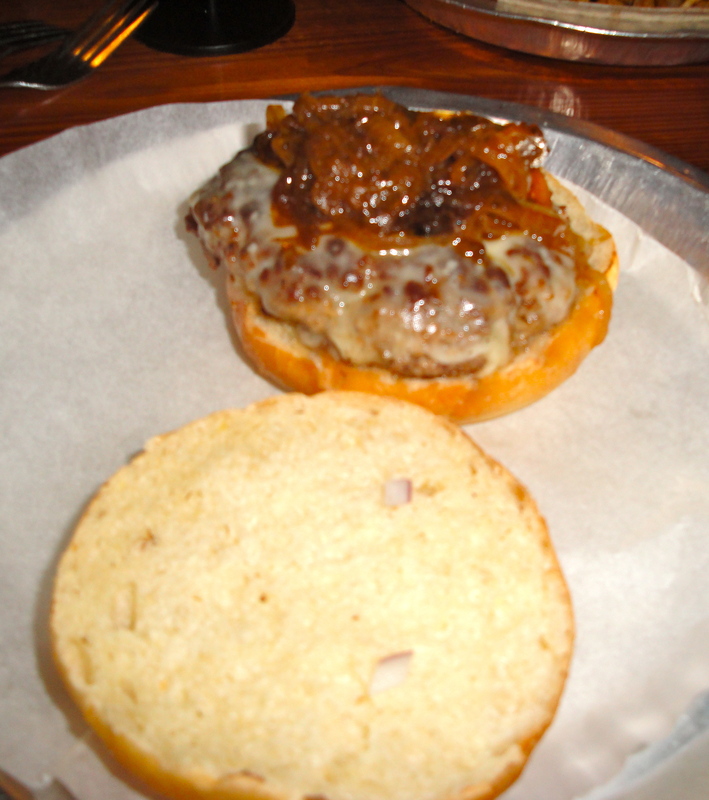 Jon and Scott had a special burger that had lamb and tzatziki on it. Tammi had a bacon and blue cheese burger. They were all good: juicy, fresh, etc. etc. 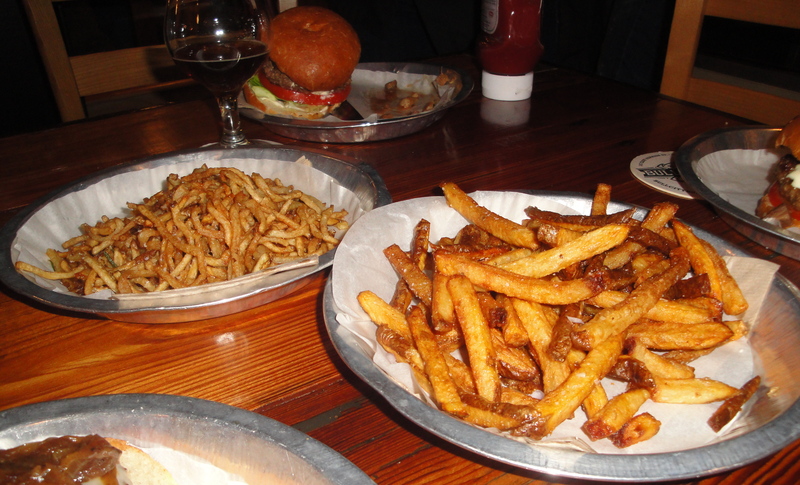 We got two kinds of fries: their duck fat and their regular “dirty” fries. The duck fat were good but I wish the fries were larger. The dirty were also very delicious. They know how to do their fried carbs. 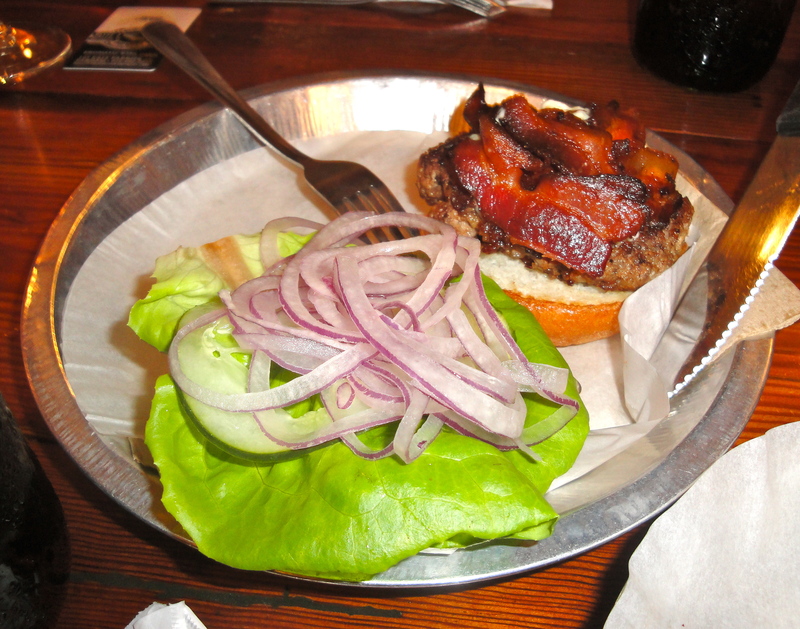 I think I still like Only Burger for my burgers, simply because the Breakfast Burger is so amazing, but if I want a “special occasion” burger in a slightly more urban chic atmosphere then I’ll head downtown to Bull City Burger and Brewery. A good burger indeed.